Given the economic climate leading to the somewhat low—yet hopeful—expectations of the 90 exhibitors at the 7th annual Antwerp Diamond Trade Fair (ADTF) held January 31 to February 2, 2016, the overall mood was still cautiously upbeat and even optimistic. The Belgian city of Antwerp has been a major diamond center for more than 400 years. Various shapes of pink diamonds from Eurotrade. A 1.44-ct diamond from MID House of Diamonds. There is no getting around it. The world’s diamond industry is under stress. And, while Antwerp, the most important global trade center, did not escape 2015 unscathed, it proved to be the best performer, with US$48.3 billion worth of diamonds imported into and exported from the historic Belgian city. Among them were 84 percent of the world’s rough diamonds and 50 percent of all polished diamonds that passed through Antwerp. Germany-based retailer Christophe Zoettl, was delighted with the show and the events surrounding the ADTF, including the breakfast seminars and gala soirée. As the industry rises and falls on the vagaries of the global economy, the slowdown in the BRIC nations, namely China—the second largest market for polished diamonds after the United States—has had a large impact on the diamond trade. Epstein added that while the “dramatic downturn in the diamond industry resulted in a slight decline in prices for rough diamonds for the first time in decades, soft prices for polished diamonds made it increasingly difficult for diamond traders to turn a profit. As a result, the average profit margins for wholesalers were between 0.11 percent and 0.37 percent,” similar to results in 2014. Epstein was not alone in his optimism. While some exhibitors at the ADTF indicated that the fair was somewhat slow this year as expected, they were nonetheless happy with new and renewed contacts. Others expressed their satisfaction with sales. From an anecdotal point of view, dealers selling fancy colors attracted the most interest from visitors along with the very unusual Buddha Cut diamond seen at one of the stands. Strolling the corridors in the historic diamond halls provided the opportunity to see a variety of dazzling diamonds, ranging in size from a few points to upwards of 100 carats, from whites to vivid color fancies, and from traditional cuts to unusual shapes. A few are presented here. One of the exhibitors featuring fancy colors was Antwerp Cut, a natural colored diamond manufacturer since 1989, which showcased a wide assortment of colored stones, among them purple, red, green, and blue. Diarough also displayed a number of fancy colors as did Diamprest, which featured mostly pink, brown, and yellow stones, averaging around 0.75 carat. “They have been selling well,” declared Diamprest’s president Antoine Haddad. Many of the exhibitors have been long time ADTF participants, among them Rosy Blue that has exhibited since the beginning of the ADTF. It sells 1 point to 10 carat white stones, as well as a number of large fancy color stones, including a large cushion cut vivid yellow. Another long-time exhibitor, Dalumi featured stones from 10 points to 20 carats plus a range of fancy yellow diamonds. A specialist in large stones, Royal Gem featured 20 to 50 carats in a variety of sizes, with some beautiful pear shapes. “Although the diamond market is struggling,” stated Ben Barmatz, the company's Director of Sales, “our high-end customers are still buying, and prices for the large stones are continuing to rise.” Brachfeld, a fifth-generation company, showcased a range of calibrated pear shapes, 0.25 to 2.5 carats, DEF/VVI+, as well as an exceptional 14-carat vivid yellow. Innovation is a hallmark of the Antwerp diamantaires and probably the most unusual diamond at the ADTF was the Buddha Cut. In the shape of a meditating Buddha, it has 33 crown facets, 21 pavilion facets in addition to the culet, and a polished girdle. Available in several versions, these tiny sculptural diamonds are generally between 0.5 and 5 carats, although they have come in sizes up to 13-carats, according to owner Jacques Korn. Laser-inscribed with an individual serial number on the girdle, these unique diamonds are manufactured and sold by Antwerp-based The Buddha Diamond Company. The most creative booth decoration was that of Beauty Gems, which displayed not only the brand’s logo in diamonds (52.42 carats) but also other lovely images created by Liesbeth Cleen. In addition to its white diamonds, from one point to two carats on average, Beauty Gems also displayed a wide variety of black diamonds, although the whites were the best sellers, according to the company’s director, Nirav Shah. Another booth whose decorations perhaps reflected the current state of the diamond trade was M. & D. Pienica, one of the ADTF’s founders. A poster ad featured a lovely lady with a diamond tear falling from her eye. David Pienica, Director, spoke frankly about the difficult times facing the industry. Drawing on his more than 32 years in the diamond business, Pienica stated that it is vitally important for companies to be healthy in order to weather the headwinds. “The global diamond industry is in the middle of a restructuring and it will probably take another one to two years to stabilize.” He remains optimistic, however, adding that trust and long-term relationships count more than ever. Lab-Grown Diamonds – A Threat? The highly appreciated breakfast seminars included a very well attended and informative presentation on lab-grown diamonds—strictly prohibited at the ADTF—presented by Jean-Mathieu Mangnay, Chief Gemologist of the International Gemological Institute (IGI). He also discussed technologies used to identify lab-grown stones mixed with natural diamonds in jewelry. Mangnay’s presentation was followed by a rather heated discussion among audience members on the undisclosed selling and mixing of lab-grown and natural diamonds. As usual, the ADTF presented Antwerp Diamond Night, a gala evening sponsored by the AWDC. This year, visitors were treated to a special fashion show featuring models on stilts gracefully walking the runway wearing the creations of the winners and finalists of the biennial HRD Awards. For the 2015 edition of the awards, HRD Antwerp invited designers to draw inspiration from their own culinary heritage while incorporating diamonds in their original creations. Out of a record number of 1531 entries, 29 designers were selected by a jury of industry experts to put their design into production. The first prize went to Tomoko Kodera from Japan for "Rice Husks," a brooch containing 400 handmade rice husks. The other finalists were Shu Liang from China, Evi Bakker from the Netherlands, and Freeman Johnson from China, while Sancha Livia Resende from Brazil was the winner of the public voting award. A second informative breakfast seminar dealt with current consumer trends and the outlook for the diamond sector in 2016, presented by French luxury expert Didier Brodbeck. He indicated that diamonds and diamond jewelry are competing with a much wider “bandwidth” of luxury consumer products than ever before, especially with the millennial generation. The importance of generic marketing for diamonds was also discussed. “The concept of the ADTF has proven a unique opportunity to bring diamond buyers, namely jewelry retailers and manufacturers, from all over the world to the diamond district and make themselves feel at home in our streets and bourses,” concluded Stéphane Fischler, President of the AWDC. Next year’s ADTF will be held the end of January 2017. Entry to the ADTF is by-invitation-only and invitations must be obtained directly from the organizer, either by recommendation from one of the exhibitors or by registering at the website, AntwerpDiamondTradeFair.com. 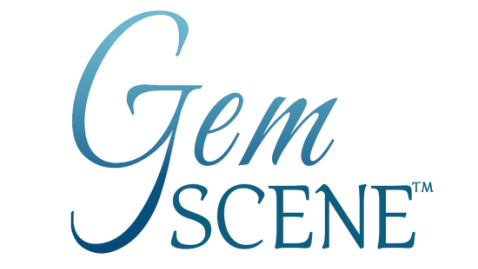 All buyers must produce verifiable documentation that they are qualified members of the gem and jewelry trade. 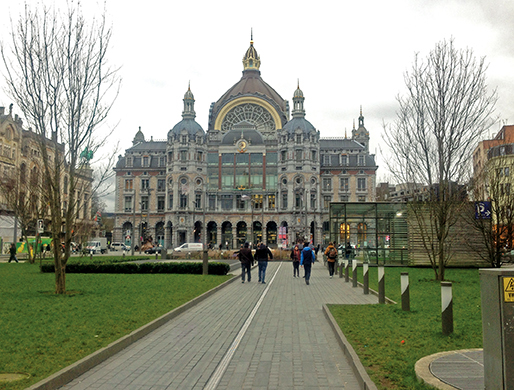 The imposing and majestic train station is a few minutes walk to the historic diamond district in Antwerp. 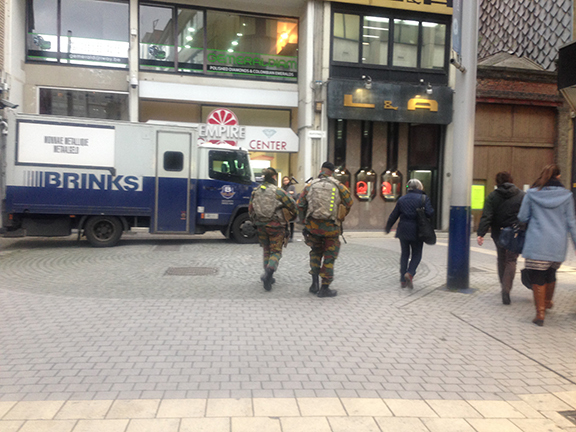 Security at the ADTF was very high, with armed guards outside on the streets and inside the fair itself in order to ensure a safe environment. A 2-ct radiant fancy intense green from Taché Diamonds. Photo: Ilan Taché. A 12.50-ct fancy light yellow Korloff Cut, from Krochmal & Lieber. Two pear-shaped diamonds, 30-cts and 34 cts, from Royal Gem. The Buddha Cut is faceted by The Buddha Diamond Company. These small statures are available in sizes ranging from 0.5-ct to 5-cts, although a 13-ct has also been made. From S. Muller & Sons: a 4-ct Intense Yellow Radiant set in a ring with side trilliants; a 2.6-ct D IF Pear shape diamond set in a necklace; 0.50ct purplish pink argyle diamond. A 20-ct vivid yellow diamond from Antwerp Cut. A 2-ct orange heart diamond from Diarough. This poster at the booth of M.& D. Pienica seemed to reflect the state of the global diamond industry today... under stress but optimistic. Models on stilts gracefully walk the runway wearing the creations of the winners and finalists of the biennial HRD Awards.